I’ve had to think a lot about digital rights management lately. Not that I wanted to. But I recently did some eye-opening contract software development for a DRM-heavy media app, just as our government up here in the Great White North introduced a new and extremely DRM-friendly copyright law, and links to Don’t Make Me Steal started popping up all over the Internet. DRM is the barbed wire of the media world. Nobody likes it except manufacturers, publishers, producers, and copyright holders … a group which includes, er, me. I’ve been stubborn and lucky enough to have had a clutch of novels published around the world—and, inevitably, pirated. As a “content producer,” I’m generally expected (especially by my publishers) to be a staunch supporter of DRM, and piracy’s sworn enemy. It’s easy to see why. Most of the arguments that echo around the Net in favor of unlimited copying range from “intellectually lazy” to “wilfully deluded.” Yes, musicians make up for much of their piracy losses with performance income, but no, the same is not possible for all other pursuits. Yes, Cory Doctorow does very well, but he’s an extreme outlier who markets himself on one of the world’s most popular blogs and has $10,000 lunches with Mark Shuttleworth. No, “real artists” will not keep at it regardless of whether they’re paid; passion is only loosely correlated with talent, and those who make a full-time living from their work do more and better than they would as hobbyists. Yes, obscurity is any creator’s primary enemy, but that doesn’t make piracy a friend. 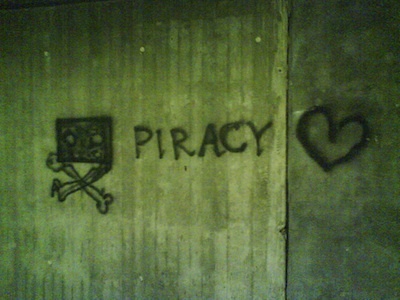 No, The Pirate Bay is not just like a library or secondhand shop. Yes, all of these arguments sound like “I want the fruits of your years of hard work, but I don’t want to reward you in any meaningful way!” wrapped in an extremely thin rationalization. Although it pains me to say this, it’s the pirates who are on the right side of history. Empires built on barbed wire inevitably collapse, and the sooner the better; while this one reigns, it perpetuates yesterday’s regimes, and squelches innovation and progress. Is piracy wrong? Yes, but that’s the wrong question. The right question is, which is worse: widespread piracy, or the endless and futile attempt to preserve DRM everywhere? So long live the pirates. Those jerks. Please don’t make me say it again. Ironically, it’s Apple who gives me hope. Yes, Apple, who—unlike Amazon—refuse to sell DRM-free ebooks. But I take heart in knowing that people have bought billions of songs from iTunes (a clumsy, irritating tool which offers by far the worst user experience of Apple’s entire product suite) even though they could easily have downloaded them for free. Most people don’t want to steal. If we content producers make our goods cheap enough, and the process easy enough, they’ll be willing to buy them. I hope. So I’ve released two of my books under Creative Commons licenses, and I’m trying to talk the major publisher who’s agreed to re-e-publish a third to do so without any DRM. So far they’re reluctant: but it’s a leap of faith that all of today’s defenders of DRM will ultimately have to make.